If you found this article, you probably have some doubts about Search.searchemonl.com. Sadly, you are most likely right to question this application as it falls under the category of browser hijackers due to its ability to alter particular browser settings. Moreover, our researchers report that the search engine might provide users not only with results matching their submitted keywords but also potentially harmful advertising content. To avoid such suspicious advertisements we recommend the application’s deletion. 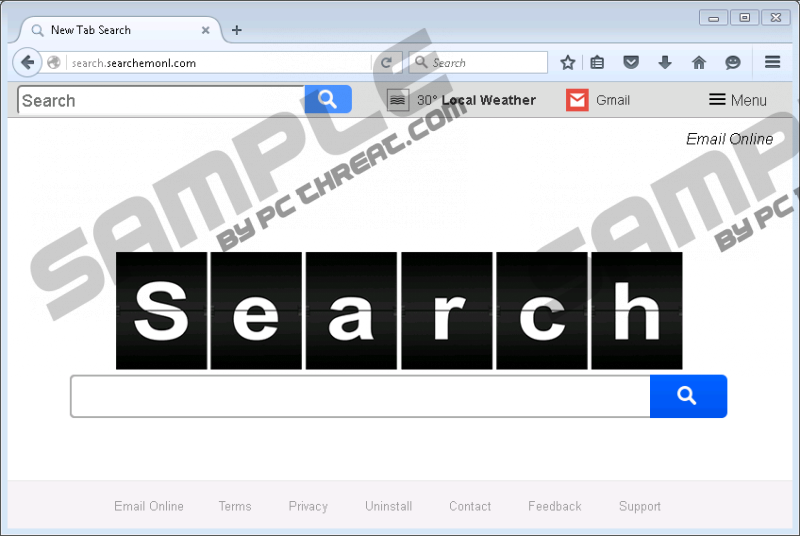 Thus, we will add a removal guide below the article to help you get rid of this browser hijacker at once. However, if you want to gather more information about Search.searchemonl.com first, we encourage you to read the text first. To begin with, it would be best to tell you how the browser hijacker’s creators might be distributing this unreliable program. The research shows Search.searchemonl.com could be spread with malicious pop-ups ads that may promote bundled installers of suspicious browser extensions or other doubtful software. Users might find these installers on untrustworthy file-sharing web pages too, e.g. sites distributing torrent files. If you occasionally visit such sites or carelessly click pop-ups ads, we would advise you to be more careful the next time. In fact, it would be best to search for more reputable sources to download installation files. For instance, it could be official publisher’s website if the application’s developer is reliable. Another way to guard the system against any threat is to secure it by installing a legitimate antimalware tool. Such program could not only warn you about malware but also periodically scan the computer and clean it from various threats. Furthermore, as our specialists tested the application, they discovered it could be another clone of the following browser hijackers: Search.fo-cmf.com, Search.searchnda.com, Search.searchpcst.com, and so on. Their almost identical appearances and ways of distribution make us think Search.searchpcst.com could have been released by the same publishers as the listed threats. Another thing they have in common is their capability to alter particular browser’s files in order to change user’s start page, new tab page, or default search engine. Plus, same as its clones the application is compatible with all major browsers (Mozilla Firefox, Google Chome, and Internet Explorer) except Microsoft Edge. Another thing users should know about Search.searchemonl.com is that it could use a modified yahoo.com search engine. In other words, even though the mentioned search engine might handle the task of collecting all results matching particular keywords you insert in the search box, the end result could be altered by the browser hijacker. To be more precise, the software might inject the collected results with advertising content from the third party. The worst part is that such advertisements could come from anywhere, so there is chance users might encounter malicious ads as well. To give you an example, malicious ads could be dangerous as they might redirect you to web pages spreading other similar threats like adware or potentially unwanted programs. Some of them could be created to distributed malware too, e.g. Trojans, ransomware, viruses, and so on. Not to mention, users might come across web pages that may try to steal their private information or trick them into revealing particular sensitive data like email address, telephone number, information related to banking accounts, etc. Therefore, if you care about your privacy or the computer’s security, we advise not to take any chances with Search.searchemonl.com and erase it immediately. There are a couple of ways to deal with the unreliable search engine. For more experienced users we would suggest removing the browser hijacker manually. To complete this task, you would have to locate particular affected browser’s files and alter some data or simply erase these files. Users who are less experienced could acquire legitimate antimalware software and perform a full system scan. Once the threats on your computer are identified, you could click the deletion button, and the tool would eliminate all detections along with Search.searchemonl.com. Type Regedit and click Enter. Find a value name known as Start Page. Choose Modify, then instead of http://Search.searchemonl.com insert a link you like and click OK.
Right-click listed value names one by one and press Modify. Replace their value data and select OK.
Open the file with Notepad and locate this line: user_pref(“browser.startup.homepage”, “http://Search.searchemonl.com”). Instead of http://Search.searchemonl.com insert another link and click OK. Locate data called Preferences, Secure Preferences, and Web Data. Right-click each of the listed files separately and select Delete. Quick & tested solution for Search.searchemonl.com removal.